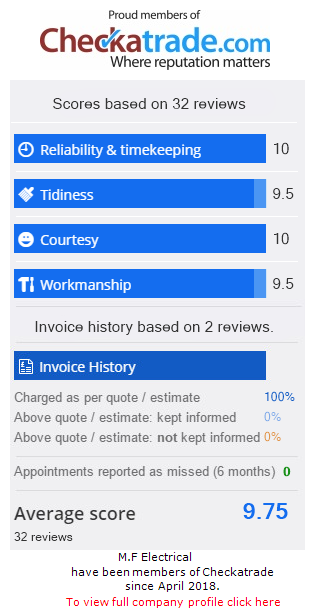 Providing the best service possible! Here at M.F Electrical we want to provide the safest, most cost effective solutions for all your electrical needs. With full NIC EIC backing on all works carried out we can provide the best service in the electrical/construction Industry. As specialists in refurbishment, extensions and new build works, we are able to provide the best quality electrical installation works around. We provide a free 1-year checkup after completion of works on full re-wires and replace any faulty socket or switch included in the original works free of charge! With the recent development of web enabled automated power control you can now control your home from anywhere in the World. From your heating system down to the single socket where you think you left an appliance plugged in and turned on. Not only can we install these devices but we also offer a demonstration on use to ensure that you can really get what you want from the system. LED lighting is now at the forefront as an energy saving option for consumers. Did you know that the average household, with 10 conventional 50w downlights, would pay £60 a year just for these lights to be turned on for an average of 3 hours per day? An LED equivalent for these lights would cost only £6 per year, so why not make savings on your electricity bill and upgrade today. Our pricing is some of the most competitive on the market and we can provide a variety of different quality fittings and finishes to suit all budgets. Enquire below for your free estimate or with any questions that you need answering. So which service is for you? Anything else, please just ask!